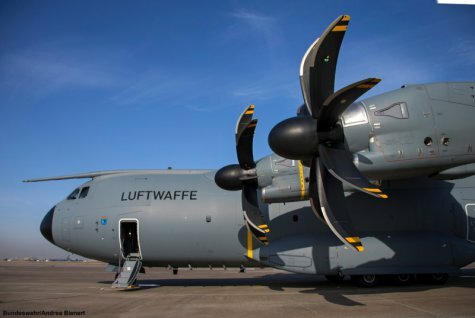 PARIS --- The financial burden of Germany’s Ministry of defense is likely to increase by at least € 500 million, as it will have to keep and operate the 13 excess Airbus A400M transport aircraft it signed up for in 2010. Germany ordered more A400Ms than it needed to obtain a larger workshare for its industry, and intended to sell them on before they were delivered, but this has now been decided impossible as no takers have been found. This was first reported by Tageschau news show on Germany’s ARD broadcast network. An alternative tabled in 2015 by German Defense Minister Ursula von der Leyen, who took office in 2013, was to form a European A400M pool which would make its surplus aircraft available to smaller European nations who lack their own. This found no takers, either. "No sale has not yet been realized." This simple sentence is the admission of a dramatic failure, and is found in a letter from Markus Grübel, the Parliamentary Secretary of State in the Ministry of Defense, to the Bundestag’s budget committee, which is the lead committee for defense spending. Germany originally said it would but 60 A400Ms, but when the program was re-baselined in 2010 reduced its planed offtake to 53, with the remaining 7 turned into options. However, since its operational needs do not exceed 40 aircraft, it has been trying since 2011 to get rid of 13 A400M transport aircraft. The Luftwaffe does not need any more, Airbus did not accept a cancellation, so the Budget Committee decided in January 2011 to plan for the immediate resale of the excess aircraft together with Airbus. But no buyer has been found for the aircraft. What to do? To store the surplus aircraft while continuing to search for a buyer is "extremely risky," writes Grübel, because it is very expensive and personnel-intensive. Ideally, the Ministry of Defense had thought to put the aircraft at the disposal of a joint, multinational airlift unit which it would operate along with other European nations, which would share the costs. But there are no concrete advances on this project, although negotiations continue. The Sueddeutsche Zeitung newspaper last month reported that Berlin was in talks with the Czech Republic, Switzerland and others, about jointly operating the 13 surplus transport planes, but like others before they have come to nothing. For now, the only option is for the surplus aircraft to be operated by the German Air Force, but this is not that easy. "For operational and tactical reasons as well as for reasons of space, it would be necessary to base the 13 A400M aircraft at another location," writes Grübel in his letter. However, the Bundeswehr doesn’t have enough surplus staff to operate the additional aircraft. So, it will need to hire additional personnel, build more infrastructure and buy additional equipment for maintenance and operation. "A rough estimate of the initial costs for the initial flight operation" of the surplus transport aircraft showed "a one-time investment requirement of at least 505 million euros," Grübel’s letter reads. The necessary reconstruction of the Untermeitingen airfield would cost another 150 million euros. For Tobias Lindner, who sits for the Greens Party on the Defense and Budget Committees, the admission by the Ministry of Defense is a kind of bankruptcy: "This decision makes it clear that the renegotiations of the A400M Treaty of 2010 do not stand up to reality," Lindner said. He is particularly annoyed by the fact that the Federal Government had also granted the manufacturer Airbus a 500-million-euro loan, the repayment of which depended directly on future success of the A400M. The repayment of the export credit is now extremely questionable in view of the lack of export prospects for the 13 surplus aircraft. "The ministry itself quantifies the risk of default with about 1.2 billion euros. The A400M program is and will remain a child needing care," says Lindner.